It's a lovely day for licking something sweet. Stop by a participating shop from 4 to 8 p.m. on May 8 for your pay-nothing ice cream treat. The hours that fall between 4 in the afternoon and 8 in the evening? There are a few ways to break those down. It's a full 1/6 of the day, so, yeah, it's a good chunk of time. It's when the sun sets, and work traditionally wraps up, at least for many people, and plenty of us eat supper after 4 and before 8 o'clock. 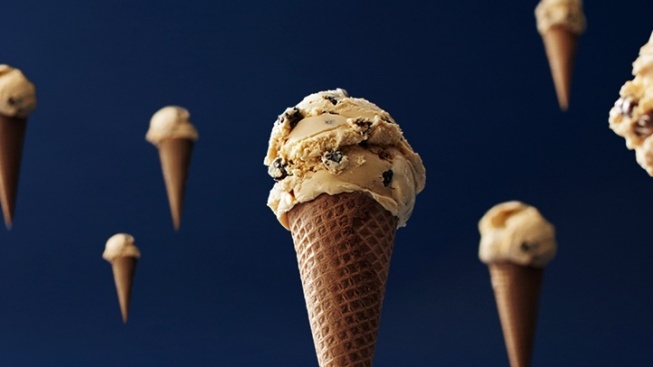 And if it happens to be Free Cone Day at participating Häagen-Dazs locations? Many an ice cream aficionado will be queued up, between 4 and 8, all to score that sweet scoop of something rich, creamy and full of spring zing. Those are the times you'll need to know for the 2018 outing for this super-forever-mondo popular event, one that does see dessert devotees, in notable numbers, joining the lines outside of their local Häagen-Dazs stores for this no-strings-attached giveaway. Well, there are no strings, but sometimes there are melty ice cream blobs, that get on your hands and pants, but, c'mon: It doesn't seem like full-on ice cream cone enjoyment without a little goopy souvenir at the end of the experience. The date is Tuesday, May 8, and the list of shops joining in may be found here. So enjoy those magical hours, in the late afternoon, around twilight, as you put your hands on a cone that's holding luscious orb of chocolate or vanilla or you name it. Just remember to quiz your pals while in line: Where does the umlaut go in the company's name? The first "a" or the second? Stump your friends while you pass the waiting time, but make sure they're facing you and not the store when they answer.